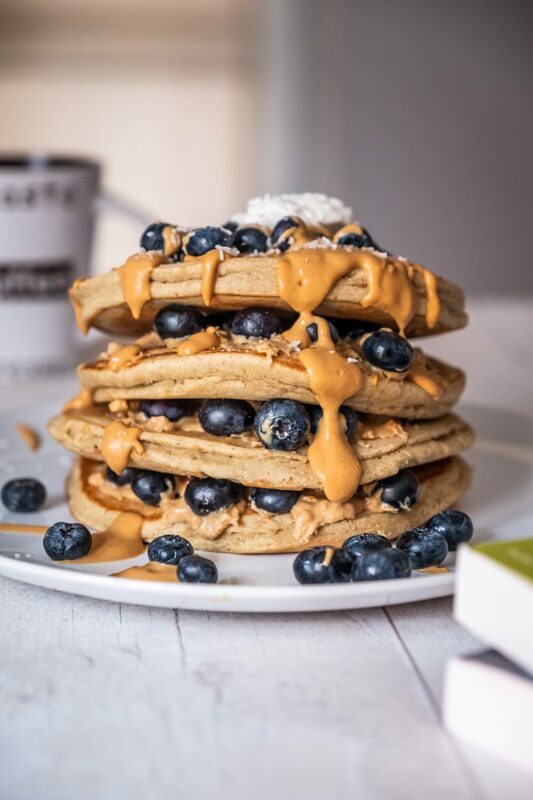 These peanut butter pancakes with buckwheat and blueberries have literally crushed my Instagram account: they’re beautiful to see and, most of all, fluffy and delicious! They’re easy to make and they’re also sugar-free, high in fiber and proteins, gluten free, dairy and lactose-free, eggs free and vegan too!! Yes, it’s all true! Let me be honest: when we associate the word “healthy” with pancakes, it all sounds ridiculous. 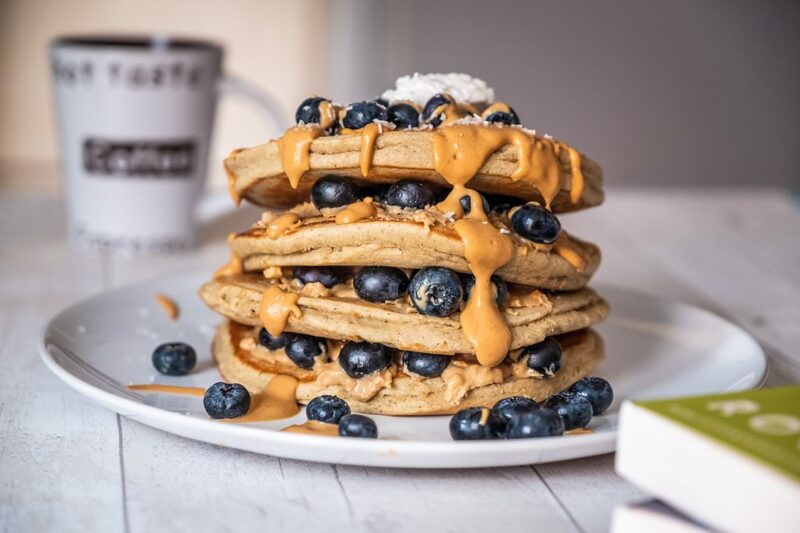 But this time, let me also reassure you: these peanut butter pancakes with buckwheat are really healthy and after having read my recipe you are going to want to make these as asap! They’re perfect for a weekend brunch or a weekday brunch or whenever you like and it’s so easy to make them at home, that it’s really a pleasure to spend some time in the kitchen experimenting. I’ve used buckwheat flour to make the batter and even if we’re a bit on the heavy side with it, buckwheat consumption is linked with several health benefits since it’s a good source of fiber and it’s rich in minerals and antioxidants. Also, this pseudocereal is naturally gluten-free and easy to work with. You may think buckwheat is rich in carbs and in fact it is: but it scores low on the glycemic index and this means it doesn’t cause unhealthy spikes in blood sugar levels and actually it helps in avoiding the rise in blood sugar after a meal. 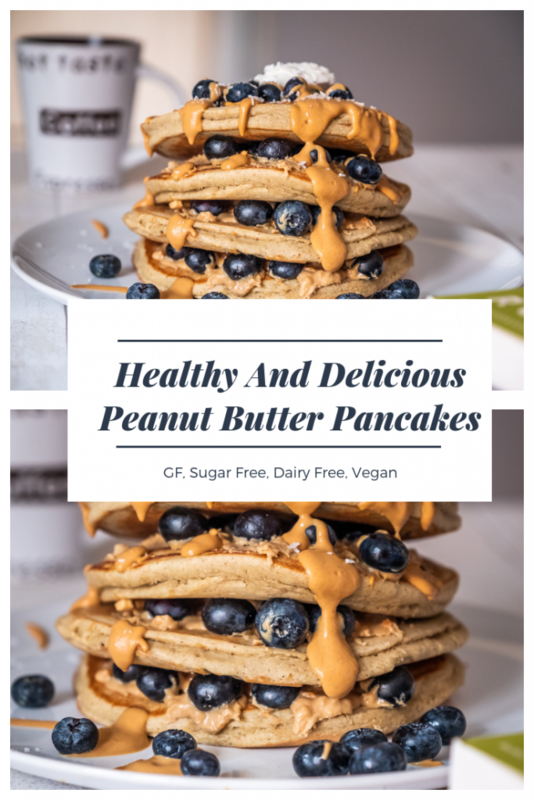 A good percentage of these healthy pancakes consists of peanut butter: in fact, I’ve added P2 powdered peanut butter both in the batter and on top of the pancakes but you can use normal peanut butter, preferably all natural. If peanut butter is involved, how healthy can these pancakes be? Is peanut butter really good for our health? It is, indeed! Of course, you need to buy unprocessed one and this means you’ve to spend a bit more and choose a natural peanut butter, only made of peanuts and maybe a bit of salt. Peanut butter contains very low carbohydrates, a huge amount of plant-based proteins and a huge amount of healthy fats: basically all the three macronutrients our body needs, in the correct amount. So said, peanut butter should be eaten in moderation and as part of a balanced diet so to avail of its benefits. Pancakes do not generally contain yeast, but they can contain baking soda, baking powder or the like as a source of leavening (like agar agar, in the case of GF pancakes). In this case, I’ve used baking powder and to make sure they were fluffy, I’ve mixed the ingredients generously so that it will be airy and, once cooked, it will stay airy and fluffy. Finally, no refined sugar is used for these pancakes: I’ve chosen xylitol powder ’cause it’s easy to mix with other ingredients. I’ve explained the benefit of cutting refined sugars from our diet here. There are a lot of products you can use to replace sugar: xylitol, erythritol, stevia, and similar products: all of them are totally natural and contain 0% sugar, but at the same time they sweeten a bit the mix. no refined sugar, no grains, no refined flour, no dairy, no lactose, no eggs. This means if you wanna make this healthy pancakes with peanut butter and you’re on a diet, you actually can: they’re good for people on a low-carb diet, for gluten intolerants, for dairy intolerants, for people on a high protein diet, and so on. Also, they’re vegan ’cause no animal products have been used: another bonus! This pancake batter is super versatile: you can throw in chocolate chips, berries, nuts, shredded coconut, spices, cacao powder, etc, to change it up if you’d like! And you can serve the pancakes with the toppings you prefer: fruit, chocolate, cheese, cream. Basically, anything you like, sweet or savory. Combine all ingredients into a high-speed blender or food processor. Blend on high until smooth. Allow batter to thicken for 20 minutes. Heat a skillet on low-medium and lightly grease with coconut oil. Once warm, pour the batter to prepare the pancakes. Once bubbles begin to form on the surface of the pancakes, flip to cook the other side. Repeat until the batter is used up. Serve pancakes with any toppings of choice.